Introducing Cousin Tony’s Brand New Firebird, one of the hottest new exports to come out of Melbourne, Australia in recent years. After securing fans across their native land with their epic live shows, and their acclaimed debut album "Electric Brown". 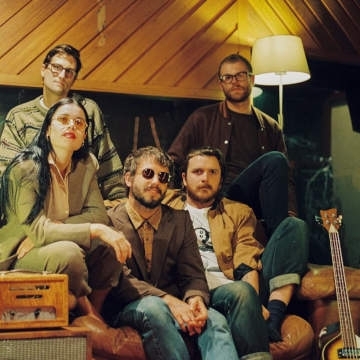 The band is fronted by Lachy Rose , an enigmatic singer/songwriter who weaves a shapeshifting mood of dynamic indie rock songs with his multi talented bandmates - Francesca Gonzales, (vocals/keys), multi-instrumentalist Pete Simonsen, drummer Nick Reid and bassist Matt Hayes. Cousin Tonys debut UK single ‘Love is Heartbreak’ is set for release on 12th April (Double Drummer /AWAL) ahead of the bands tour. "Love is Heartbreak" is an ambitious, kaleidoscopic slice of alternative indie-pop that perfectly sets the scene for their forthcoming new album, "New Romancer" to be released mid year. Watching Cousin Tonys perform is an exciting, fun, moving and ultimately rewarding live experience!